Do we all know this story? I feel like we all know this story. The surface of it, at least. When they met, she - Mrs. Simpson - was a Baltimore-born socialite who was living in Britain with her second husband; he - the Prince of Wales - was an heir with a penchant for romancing married women. They met courtesy of one of Mrs. Simpson's friends, who also happened to be one of the Prince's mistresses, and despite all raised eyebrows, a romance ensued. If anyone thought that he'd come to his senses following his accession as King Edward VIII after the January 1936 death of his father, George V, and do what he was "supposed" to do, well, they were quite wrong. Points against Wallis as Queen piled up left and right: she was American, she was already divorced once and would have to be again (and he was head of the Church of England, which didn't allow divorced people to remarry), she held a noticeable control over the monarch (who already had a history of overstepping his political boundaries), and so on and so on. But the King was more determined than ever that he would marry her, even indicating that he would "go" if needed. 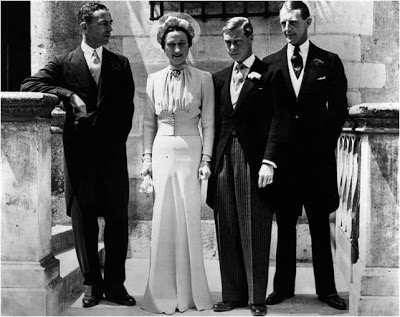 When no satisfactory solution was found following her divorce, he did indeed go: in December 1936, he abdicated the throne in order to marry Wallis, and his younger brother became King George VI. 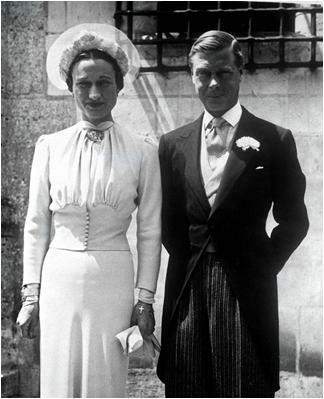 They married in France the following June, with no members of the royal family present. 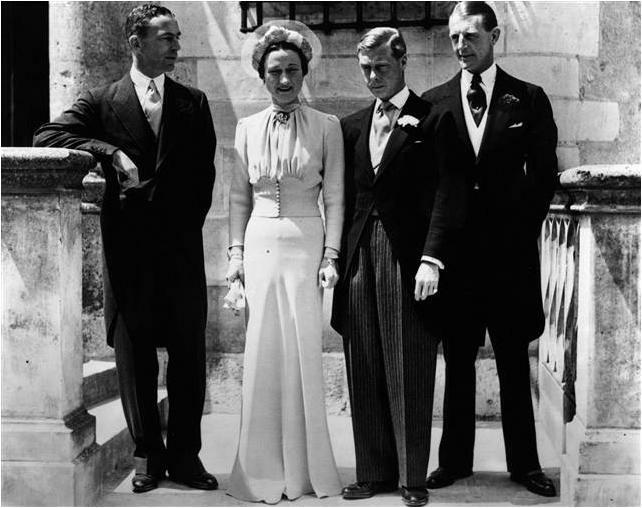 The ex-king had been titled as His Royal Highness The Duke of Windsor; Wallis (who by this time had reverted to her maiden name, Warfield) was denied an HRH styling on marriage. Her distance from the royal family was emphasized by her clothes and jewels, which were purposefully the antithesis of the frilly concoctions and traditional styles worn by the new Queen Elizabeth. 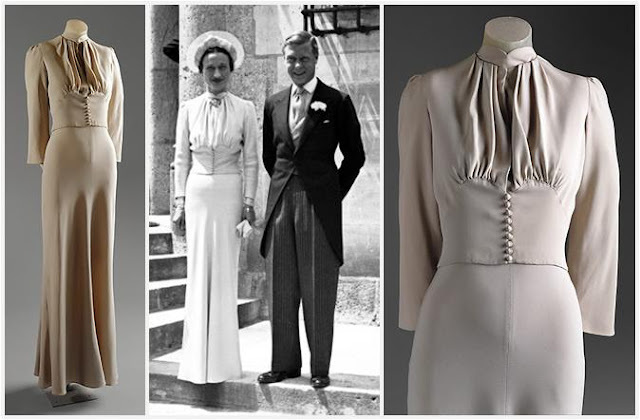 The wedding ensemble is a prime example: it is perfectly appropriate for a third wedding, but perfectly not what other royal wedding gowns of the time were. The bride wore a silk crepe wedding dress with a sleek long skirt featuring a slight flare at the bottom. The dress was topped by a jacket with a cinched waist and a button closure; the top featured a high collar, long sleeves, and draping to a heart shape below the bust line. From American company Mainbocher, it was done in "Wallis blue", a light shade made to match her eyes. She accessorized with matching blue leather shoes from Georgette, gloves in the same silk crepe, and a blue straw hat made by Caroline Reboux topped by coq feathers and a halo of blue tulle (Cecil Beaton, who took the wedding portraits, quite famously hated that hat, and I can't disagree). It was then and has been since a frequently copied dress. The whole ensemble was donated by the Duchess in 1950 to the Metropolitan Museum of Art, but it has lost its blue color over time thanks to a defect in the dye. 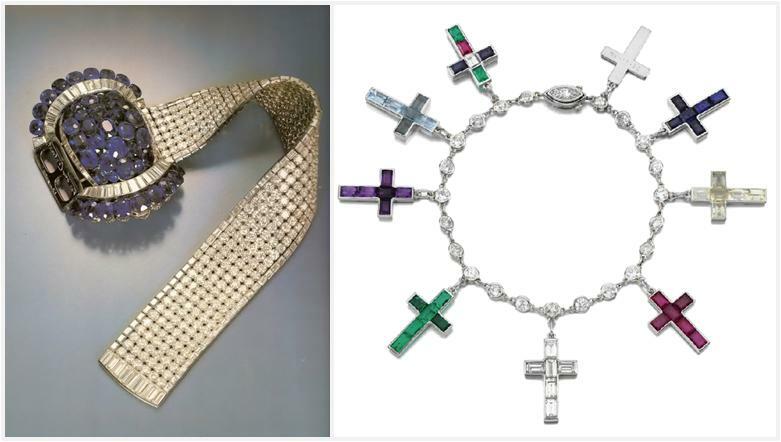 Wallis was equally famous for her jewels, and on her wedding day she wore a few important pieces. At her neck, a clip made in 1935 by Van Cleef & Arpels; on one wrist, a Van Cleef & Arpels sapphire and diamond bracelet which has been dubbed the "marriage contract" bracelet as it was given by the Duke of commemorate their civil marriage and is engraved with the words, "For our contract 18.V.37"; on the other wrist, a particularly famous piece of hers, a Cartier bracelet with dangling gem-set Latin crosses gathered over the years for various special occasions, each one engraved. The Duchess' jewels were auctioned for charity after her death, and various pieces have come up for sale again over the years. The Duke and Duchess of Windsor were married until his death in 1972; she passed away in 1986. They never had any children, and spent their married life primarily in France with time spent in the United States too, plus a stint as Governor of the Bahamas for the Duke. The dress, the jewels, the basic facts - these are the easy things here. The real story, though, is much more complex. Their romance has been billed as one of the greatest of all time, a king giving up everything for love...but the closer you look, the less rosy the picture becomes. 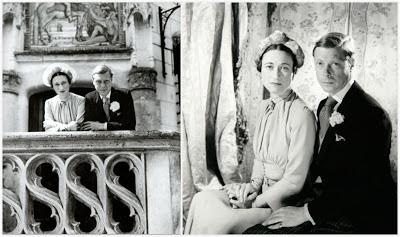 Beaton observed that Wallis was "determined to love the Duke, though I feel she is not in love with him. She has a great responsibility in looking after someone who, so essentially different, relies entirely upon her." Did she really understand what she was getting into, with a man prone to obsessive love? (There are indications that she married him because he penned her in, when this outcome wasn't what she had anticipated.) Was he really that committed to being king in the first place? (Comments made both by Edward and by those close to him indicate that he was likely quite unsuitable in several ways.) I can't begin to probe the real depths of the story here, really. They are a couple you have to make your own judgment on, to be sure. Is this wedding dress an all-time classic?